With the first quarter of 2018 in the books, the global economy appears to be running fairly smoothly despite a good deal of domestic and geopolitical uncertainty in various regions across the globe. In fact, the global economy is going so well, FocusEconomics panelists expect the global economy to grow 3.4% in 2018, which would represent the strongest rate in seven years. With that said, in this post we highlight some of the economies that are growing (and shrinking) in 2018. Venezuela remains beset by profound economic and political crises. According to figures released by congress, which the opposition controls, the economy shrank a staggering 13.2% in 2017, marking the fourth year of a crippling recession. Citing ongoing fiscal struggles, Moody’s downgraded the government’s credit rating to C from Caa3 on 9 March. As the country descends deeper into crisis, it is gearing up for presidential elections now scheduled for 20 May, after they were initially moved forward to 22 April from December, when they are usually held. Many political parties opted to not participate in what they see as fraudulent elections that lack legitimacy. Moreover, the U.S. and the EU are contemplating additional sanctions against the country, while a group of Latin American nations, known as the “Lima group”, rejected the election and its outcome. In the first week of March, former governor Henri Falcón broke with the opposition coalition to launch his presidential candidacy. Although polls suggest that he could be a serious challenger, it is unlikely that he will beat Maduro. Venezuela is expected to remain in a deep recession in the short to medium term on the back of hyperinflation, shortages of goods and large fiscal imbalances. While a rebound in the oil sector could alleviate some of the battered country’s issues, oil prices are expected to remain below the USD 100 mark, making it unlikely oil profits will significantly improve the country’s fortunes. FocusEconomics panelists see the economy contracting 7.7% in 2018, which is down 1.0 percentage point from last month’s forecast. In 2019, GDP is seen falling 1.5%. This year, the Bank of Japan’s ultra-loose monetary policy, a tight labor market and resilient global growth will benefit the Japanese economy. The main downside risks stem from an abrupt slowdown in China, a key trading partner for Japan, and heightened geopolitical tensions that could strengthen the yen. FocusEconomics panelists see the economy growing 1.3% in 2018, which is unchanged from last month’s forecast, and 1.0% in 2019. The UK economy looks in decent shape so far this year. In February, the services PMI rose to a four-month high thanks to faster new orders growth, while the manufacturing PMI was well in positive territory. Employment surged in November–January, while the unemployment rate ticked down, and nominal wage growth is finally picking up after a prolonged period of depressed readings. Coupled with easing price pressures, this should lessen the strain on consumers. Chancellor Philip Hammond unveiled the Spring Statement on 13 March. Taking advantage of better-than-expected borrowing forecasts, it hinted at a slightly looser fiscal stance to raise spending on cash-strapped public services. A few weeks later, the government and unions reached a pay agreement for 1.3 million healthcare service staff, which will see above-inflation wage rises over the next three years. Around the same time, a draft agreement was reached between the UK and the EU on a 21-month transition period after Brexit, paving the way for trade talks. Volatility in financial markets, a strong U.S. dollar and surging oil production in the United States sent oil prices down in early February, threatening to derail the Kingdom of Saudi Arabia’s economic recovery. Although oil prices are expected to remain relatively high this year compared to in 2017, Saudi authorities signaled that they will likely tap international bond markets for the third consecutive year in 2018, as early as March, to ease fiscal pressures. Meanwhile, Crown Prince Mohammed bin Salman continues to cement his political power following November’s massive crackdown on corruption that affected prominent businessmen, princes and top officials. On 26 February, the Saudi government announced that several top commanders had been removed, including the military chief of staff and the leaders of air and land forces. The economy will benefit this year from higher oil prices compared to 2017 and strong global growth. Increased oil revenues will allow the government to adopt a more expansive fiscal stance. That said, persistent geopolitical threats and capped oil supply are expected to limit the economic recovery. FocusEconomics Consensus Forecast panelists expect growth of 1.6% in 2018, which is unchanged from last month’s projection. In 2019, growth is seen picking up pace to 2.3%. Incoming data suggests that Russia’s economic recovery was broadly steady in recent months, although growth likely remained lackluster. The manufacturing PMI fell to the lowest level since July 2017 in February, and the Ural oil price also lost some recent gains. However, industrial production expanded notably in January, after two months of contraction, while exports grew at a double-digit pace in December, the latest month for which data is available. Overall, the economy has come a long way since the 2015–2016 recession, and on 23 February, S&P Global Ratings upgraded Russia to investment grade status after three years at junk—raising the rating from BBB- to BB+ with a stable outlook. The move sparked a rally in Russian assets. Meanwhile, President Vladimir Putin is widely expected to win the 18 March election, ushering in a continuation of current economic policy. FocusEconomics analysts trimmed their GDP forecasts this month, following a weaker-than-expected print for 2017. Limited oil production is expected to keep activity restrained this year, although the recovery is seen gaining modest steam from last year supported by low inflation, reduced interest rates and higher commodity prices. FocusEconomics Consensus Forecast panelists see GDP expanding 1.8% in 2018, which is down 0.1 percentage points from last month’s forecast. In 2019, growth is seen stable at 1.8%. A third estimate confirmed that quarter-on-quarter economic growth in the fourth quarter of 2017 picked up steam compared to the preceding quarter. High business confidence and cheap credit supported growth in fixed investment, while strong overseas demand buoyed the external sector. The latest data, however, suggests that activity cooled slightly in Q1 of this year. Month-on-month industrial production plummeted in January, and consumer and business confidence have weakened since January. Declines in survey-based data could partly reflect growing apprehension over the reform agenda of President Macron’s administration. The president has vowed not to back down in his attempt to reform the highly indebted state-run train operator and the public service, which would collectively result in the downsizing of 120,000 state employees. Labor unions, in turn, have organized massive nationwide strikes from March until June. The stakes are high for the president, since failing to push through these changes would dent his political capital and likely limit the scope of future reforms. The French economy is set to grow at a strong rate in 2018 and 2019 on the back of elevated fixed investment and healthy private consumption. Disruptive strikes could, however, weigh on economic activity in the second quarter of this year. Panelists participating in the FocusEconomics Consensus Forecast expect GDP to grow 2.1% in 2018, which is unchanged from last month’s forecast. For 2019, the panel sees growth of 1.9%. GDP clocked a fourth consecutive period of expansion in the final quarter of last year, with growth rising at the fastest pace in nearly a decade. The reading suggests that the Greek economy has finally found its feet after years of crisis, although it is far from firing on all fronts. Booming investment activity drove the fourth quarter’s acceleration, while household spending fell sharply, illustrating fragile fundamentals. Available data for Q1 points to seesawing momentum: Industrial production plummeted in January, but the manufacturing PMI jumped to a multi-year high in February. Meanwhile, all eyes are on the country’s banking sector ahead of stress test results by the ECB, which are expected to be released in May and will signal if the banks need to raise additional capital. In March, the country’s four biggest lenders reported over EUR 5.0 billion in bad loans. Growth is expected to gain steam this year thanks to improving labor market dynamics and a more stable political backdrop. Debt relief negotiations are currently ongoing and will likely be key to the economy’s long-term success. FocusEconomics panelists see GDP expanding 2.1% in 2018, unchanged from last month’s forecast. In 2019, growth is expected to be 2.2%. The Mexican economy grew less than initially reported in the final quarter of last year, with a second estimate showing the weakest year-on-year expansion in GDP in four years. High-frequency investment data suggests that subdued capital outlays continued to weigh on the economy’s performance, while strong service activity growth points to household spending as the main contributor to growth in Q4, despite high inflation, tight monetary conditions and slower credit growth. Leading indicators for this quarter signal a moderate turnaround: The manufacturing PMI and trade data were relatively positive early in the year, while the unemployment rate remained near one-decade lows in January. Meanwhile, Mexico will be temporarily exempt from U.S. tariffs on steel and aluminum imports set to take effect later this month. The exclusion is likely contingent on satisfactory NAFTA negotiations, with progress in the most recent round of talks—concluded in early March—slow and cumbersome. Softer inflation and tight labor conditions should buttress private spending this year, while strong factory output in the United States is expected to remain supportive of manufacturing exports. Nonetheless, NAFTA talks and upcoming general elections set for July will continue hampering private investment, dragging on overall growth. The FocusEconomics panel expects growth of 2.2% in 2018, which is unchanged from last month’s estimate. For 2019, analysts see growth accelerating slightly to 2.3%. Kuwait’s economic prospects are improving, with the economy expected to return to growth this year on the heels of what appears to have been a consumer spending-driven turnaround in the second half of last year. Consumer sentiment was again upbeat in January, likely benefiting from a boost in real estate prices and higher private-sector bank deposits. On the other hand, low oil prices and full compliance with OPEC production cuts have battered the public coffers. This year’s budget, approved in late January, will require significant borrowing and drawing down reserves. Missing from the budget was the introduction of the VAT agreed to by the country’s GCC peers, which lawmakers will likely delay until next year. Higher oil prices and infrastructure spending will underpin fixed investment this year, while lower unemployment and the delay in the introduction of VAT will support consumer spending. Over the medium term, further delays in long-overdue structural reforms could weigh on growth. FocusEconomics panelists see growth at 2.3% in 2018, down 0.1 percentage points from last month’s forecast, and 2.9% in 2019. Angela Merkel was formally re-elected as Chancellor on 14 March, ending an over five-month cycle of political uncertainty. The coalition deal with the Social Democrats (SPD) encompasses some additional spending measures but is unlikely to alter Germany’s fiscal stance, despite a changing of the guards at the finance ministry. Under the previous “grand coalition”, the economy picked up pace; last year, it grew at the quickest speed since 2011. That momentum should have carried over into 2018. Although available indicators paint a mixed picture, this is chiefly due to seasonal effects. Industrial production and retail sales contracted in January over the prior period, but still showed robust expansion in annual terms. Moreover, the composite PMI and sentiment indicators remained elevated throughout the first quarter, pointing to sustained economic momentum. The renewal of the grand coalition brought a return to stability, and the coalition’s proposed fiscal stimulus should propel private and government consumption this year. Moreover, wages are likely to grow robustly, boosted by the collective wage agreement for industrial employees in the Baden-Württemberg state—this should have a spillover effect in other states. Fixed investment and external demand are also expected to remain resilient. Downside risks persist due to the strong euro and rising protectionism in the U.S., which is an important export market for German goods. Analysts see GDP expanding 2.4% in 2018, unchanged from last month’s estimate, and 1.9% in 2019. Growth in Brazil accelerated notably in the last quarter of 2017, although it fell short of market expectations. It was led by strengthening household spending on the back of falling unemployment and low inflation and a turnaround in fixed investment. According to available indicators, the positive economic momentum seems to have carried over into the first quarter of this year. In January, the current account deficit narrowed year-on-year. Moreover, in February business confidence moved into optimistic territory for the first time since mid-2013, and the manufacturing PMI rose on the back of solid domestic demand and job creation. However, in the same month, consumer confidence dipped, remaining deeply entrenched in pessimistic territory. The government’s decision to postpone the reform of the country’s generous pension system prompted Fitch Ratings to downgrade Brazil’s credit rating from BB to BB- in late February. Fitch, which also revised the outlook from stable to negative, cited the bulky government debt and troubled political environment as additional reasons for the downgrade. Manageable inflation and improving labor market conditions should underpin consumer spending this year. A rebound in fixed investment is expected on the back of more favorable financing conditions due to monetary easing and rising business confidence. However, a market-unfriendly outcome from October’s elections poses the main downward risk to the outlook. FocusEconomics panelists see the economy growing 2.5% in 2018, unchanged from last month’s forecast, and 2.7% in 2019. Comprehensive GDP data confirmed the Spanish economy’s robust performance in the final quarter of last year, dispelling concerns of a severe slowdown caused by Catalonia-induced uncertainty. Discretionary household spending benefitted from solid labor conditions and low borrowing costs. Likewise, leading indicators point to a healthy first-quarter outturn. Social Security affiliations—a proxy for employment growth—were upbeat in February after a positive January reading, while the February PMI showed a broad-based improvement in business conditions amid waning political uncertainty. Indeed, noise linked to Catalonia’s attempt at gaining independence has waned in recent months, although the sides are far from reaching a long-term solution. Meanwhile, Spain’s minority government plans to approve the 2018 draft budget on 27 March and submit it to congress a week later, where it still lacks sufficient cross-party support. Approval of the budget had been previously postponed due to backlash from the government’s heavy-handed response to the situation in Catalonia. A positive outlook for the economy should fuel resilient fixed investment growth, while continued employment gains, accommodative monetary conditions and relatively subdued inflationary pressures should buttress private consumption. The external outlook is similarly encouraging, with healthy global trade flows and higher competitiveness supporting overseas shipments. Catalonia’s protracted conflict, however, remains a source of concern. Our panel sees growth at 2.7% this year, unchanged from last month’s estimate. For 2019, our panelists foresee growth of 2.3%. The strong tailwinds that were in place in 2017 are keeping the non-oil economy in the UAE sailing smoothly in the early months of 2018, despite a slowdown following the introduction of a 5% VAT in January. The non-oil PMI receded to a five-month low in February on lower output growth but remains in expansion territory, buttressed by strong domestic demand. Moreover, despite the constraints imposed by the OPEC agreement to cut oil production, the hydrocarbon sector is benefiting from higher oil prices compared to last year. Looking ahead, stronger oil revenues are poised to support government spending this year. Notably, a large increase in infrastructure spending is expected, especially in Dubai, which hosts the 2020 World Expo and is already benefitting from a boom in construction. Strong public sector support should drive a sharp increase in growth in the non-oil economy this year, while household consumption remains constrained following the implementation of VAT. Public spending should furthermore be reinforced by higher oil prices amid healthy global growth. Finally, tourism growth will likely remain robust, particularly in Dubai as the city prepares for the 2020 World Expo. However, downside risks related to regional instability remain, notably the ongoing feud with Qatar, as well as risks of volatility in oil prices. FocusEconomics panelists expect GDP to increase 2.8% in 2018, which is unchanged from last month’s forecast, and 3.3% in 2019. The Qatari economy is showing resilience this year despite the ongoing embargo. Non-residential central bank deposits were fairly stable in January after rising in December for the first time since last April, while recent bond and loan placements by the Qatar National Bank demonstrated foreign investors’ appetite for Qatari assets. Exports surged in January thanks to the hydrocarbon sector, with the trade surplus up over 50% year-on-year, while industrial production improved in December after two consecutive monthly contractions. In addition, following sharp price falls from June–November, the housing market appeared to stabilize in December. This comes after Q3 growth was boosted by a dynamic construction sector. The economy should gain traction in 2018 thanks to stronger fixed investment—aided by ongoing preparations for the 2022 World Cup—and healthy global growth. Nevertheless, the embargo will weigh on the outlook until a diplomatic solution is reached. FocusEconomics panelists forecast growth of 2.9% in 2018, unchanged from last month’s projection, and 2.7% in 2019. Newly inaugurated President Sebastian Piñera inherits a Chilean economy which continues to gather pace so far this year. Economic activity in January overshot expectations for the third straight month, thanks to healthy growth in both the mining and non-mining sectors. Furthermore, recent data points to rising activity in the construction sector last November and December on higher employment and sales. This comes after a prolonged period of negative readings and bodes well for investment in the fourth quarter. In addition, in February business confidence surged and consumers remained broadly optimistic. On the downside, despite accelerating growth momentum, in the November–January period the unemployment rate rose year-on-year. The new president has pledged to pare down the fiscal deficit, which was virtually unchanged last year compared to in 2016. This will be key to slowing the rapid rise in the public-debt-to-GDP ratio. Growth should pick up markedly this year thanks to a turnaround in investment, supportive monetary policy and higher wages which should lift private consumption. In addition, healthy global economic activity should boost exports. However, the economy will remain vulnerable to fluctuations in copper prices and potential labor disputes at key mines. FocusEconomics Consensus Forecast panelists see growth of 3.1% in 2018, up 0.1 percentage points from last month’s forecast, and 3.2% in 2019. Israel’s economy wrapped up last year with unexpectedly robust annualized growth in the fourth quarter. Although growth eased from the third quarter on slower consumer spending, it remained elevated thanks to the strength of the external sector. Household spending experienced a sharp correction from a quarter earlier, slowing despite near-full employment and record-high consumer sentiment. Meanwhile, exports of goods and services closed the year impressively on buoyant high-tech services exports and a surging tourism sector—both proving resilient despite the strengthening of the shekel. Leading data from the first quarter has been mostly positive, with upbeat survey data suggesting that consumers are still benefiting from the tight labor market, while external trade appears to be reaping gains from a booming global economy. Prime Minister Benjamin Netanyahu has been weathering a dramatic series of corruption allegations, but his political fate over the short term is unlikely to meaningfully alter the balance of power, given the broad support for his Likud party. A booming global economy is expected to deliver robust growth in exports this year, while household spending should get a boost from near-full employment and resilient property values. Accommodative fiscal policy and ultra-loose monetary policy will lift spending and incentivize investment, respectively. Heightened Israeli-Palestinian tensions could, however, threaten inbound tourism. FocusEconomics panelists expect GDP growth of 3.3% in 2018, unchanged from last month’s forecast, and 3.2% in 2019. The Hungarian economy shifted into a higher gear in the fourth quarter, expanding at the fastest pace since 2014. While a breakdown by components is not yet available, the acceleration was likely driven by buoyant domestic demand, as the resumption of inflows of EU investment funds and favorable financial conditions lifted business confidence and spurred strong growth in key sectors such as construction. Unemployment that was at a multi-year low, coupled with high consumer confidence and wage hikes, boosted retail sales in Q4, which expanded at the fastest pace in six quarters. More recent data suggests that momentum likely carried over into 2018. In February, economic sentiment hit a new all-time high thanks to a jump in business and consumer confidence. On the political scene, the ruling Fidesz party suffered an unexpected defeat in a local by-election on 25 February. The defeat, which occurred in a regional stronghold, hints that the party’s expected lead in the upcoming general election on 8 April will be narrower than initially anticipated. A solid domestic economy and a pick-up in external demand should support robust growth this year. FocusEconomics panelists project the economy will expand 3.6% in 2018, which is unchanged from last month’s forecast. For 2019, the panel sees growth moderating to 3.0%. Annual GDP growth in Peru slowed considerably in the last quarter of 2017, in part due to a weaker external sector, which saw exports declining and imports—especially of capital goods—rising in yearly terms. Softer household spending and fixed investment also weighed on growth. Moving into 2018, the economy seems to have broadly maintained the moderate pace of expansion seen in 2017, which was restrained by a troubled political environment. In January and February car sales dropped year-on-year, and the unemployment rate increased. In February business confidence declined, although it remained in optimistic territory, and consumer confidence plunged to the lowest level so far during President Kuczynski’s administration, which began in July 2016. That said, public investment continued to grow robustly in January, and in the first two months of the year credit to the private sector expanded at a healthy pace. The possibility of a new impeachment vote, following a failed attempt in December to oust the president, is generating additional political instability. This year solid credit growth, accommodative monetary conditions and a strengthening mineral sector are expected to spur business investment, which, together with rising public infrastructure spending, should support fixed investment. Moreover, income gains and lower inflation will likely underpin household spending. Political uncertainty, which could further hit sentiment, remains the main downside risk to the outlook. FocusEconomics panelists see GDP expanding 3.7% in 2018, unchanged from last month’s forecast, and 3.8% in 2019. The Turkish economy closed 2017 on a solid note, with industrial production and retail sales data for the fourth quarter pointing to only a very slight moderation in growth momentum in the last stretch of the year. Incoming data for the first quarter of this year is similarly upbeat, with the manufacturing PMI averaging its highest figure in seven years in the first two months of the year, and business sentiment recording back-to-back increases in the same period. Nonetheless, exceedingly robust growth momentum continues to put pressures on core inflation and the current account, with the latter’s deficit widening to a four-year high in December on the back of soaring imports, including of gold. On the political front, the Afrin operation—which aims to expel Kurdish militias from the Syrian canton—has galvanized nationalist support for President Erdogan. Increased political capital, which is compounded by the ruling AKP’s recent alliance with the right-wing nationalist MHP, and robust economic momentum could compel Erdogan to call for snap general elections this year. Increased speculation on an early call for elections should keep authorities’ support for the economy robust this year. Nonetheless, Turkey’s excruciating dependence on short-term portfolio inflows to finance its external deficits remains a key risk to growth, particularly as the Fed tightens further this year. The FocusEconomics panel expects growth of 3.9% this year, which is unchanged from last month’s estimate. It expects growth of 3.8% in 2019. Last year’s economic momentum seems to have carried over into the new year with merchandise exports and tourism growing solidly in January. This suggests that the strong performance in the external sector continued after having picked up slack from subdued domestic demand last year. Private consumption started 2018 on a strong note with an across-the-board expansion in annual terms although household spending remained fragile. The manufacturing sector was supported in January by private consumption and the external sector, and saw a strong rise in new orders. Economic growth should remain robust this year on the back of a pickup in government consumption and fixed investment, while private consumption growth is expected to remain solid and export growth will likely moderate due to a large base effect. Although the high level of household debt remains a concern, the chief downside risks to the economy are tense geopolitical situation and U.S. trade policies, which could spark a global trade war. Additionally, Thailand could face greater scrutiny since it met the United States’ criteria as a currency manipulator. Domestic political turmoil in the build up to this year’s elections could also dent investor confidence. FocusEconomics panelists expect the economy to grow 3.9% in 2018, up 0.1 percentage points from last month’s forecast. The panel projects growth of 3.7% in 2019. GDP growth continued at a strong rate in the fourth quarter in year-on-year terms, although the pace moderated from the third quarter. While a breakdown is not yet available, buoyant retail sales and declining unemployment in Q4 suggest growth continued to be driven by household consumption. The figure brought growth for 2017 to the highest level in nine years. However, the current account deficit almost doubled from 2016 on surging imports. Robust growth likewise translated into surging profits and declining Non-Performing Loans for Romanian banks, which bodes well for credit provision. In January, new car registrations jumped, putting the important automotive sector on a strong footing at the start of the year. Meanwhile, the political situation remains tense. In late February, there were large protests against the justice minister’s move to seek the dismissal of the chief of the anti-corruption directorate. Unrest, if protracted, could affect investor sentiment. The Romanian economy should shift into a lower gear this year but nevertheless expand robustly, driven by consumer spending, which will be restrained by rising inflation and more moderate wage growth. Fixed investment growth is expected to gain steam on increased disbursements of EU funds and healthy credit expansion. However, a widening fiscal deficit limits the government’s room for maneuver in case of unexpected shocks, while continuing political turbulence constitutes the main downward risk to the outlook. FocusEconomics panelists expect growth of 4.5% for 2018, up 0.1 percentage points from last month’s forecast. They see the economy expanding 3.6% in 2019. Although economic growth is moderating in SH 2017, which ends in March 2018, it remains strong on the back of resilient oil export growth amid higher prices for the commodity. In recent weeks, however, the slide of the rial against the U.S. dollar worsened, disrupting economic activity and adding upward pressure on inflation. The rial has been hit by concerns around the reinstitution of economic sanctions by the U.S., which triggered currency speculation in the parallel market. To restore the value of the rial, on 28 February the government introduced restrictions on the use of U.S. dollars and cracked down on illegal money changers in Tehran, arresting around 90 currency traders. The Iranian economy is recovering following years of tough economic sanctions. However, large macroeconomic imbalances and fears the U.S. could reinstate sanctions are threatening to derail Iran’s economic recovery. FocusEconomics Consensus Forecast panelists see growth of 4.2% in SH 2018, unchanged from last month’s estimate. In SH 2019, growth will remain broadly stable at 4.4%. Available data for the first eight months of FY 2018, which ends in June, suggests the Pakistan's external sector has been weighing on economic growth and stressing the current account deficit. Exports in the eight months through February were unable to keep pace with the surge in imports, held back by the still-overvalued rupee. Moreover, imports have grown rapidly on the strength of domestic demand, which has shown resilience even as subdued remittance inflows have moderated consumer spending gains. Meanwhile, fiscal slippage has only exacerbated pressures in the external sector, and risks of further deterioration have additionally grown in the run-up to the 15 July general elections. Buoyant household spending related to the recovery of the agricultural sector, as well as robust CPEC-linked investment, will support upbeat economic growth this fiscal year. That said, the economy will take a hit from underwhelming export growth and booming imports. Political uncertainty is also weighing on the outlook ahead of July’s vote. FocusEconomics panelists expect growth of 5.1% both in FY 2018 and FY 2019. According to available indicators, the Indonesian economy continued to perform robustly in Q1. Consumer confidence remained elevated in the first two months of the year: This, together with declining inflation, bodes well for private consumption, a picture only partially obscured by a dip in retail sales in January. Moreover, the manufacturing PMI returned to positive territory in February pushed up by rising output and new orders, suggesting fixed investment continued to expand healthily on the back of the government’s ongoing infrastructure push. However, S&P Global Ratings recently warned that the current increase in development spending risks deteriorating the balance sheets of state-owned enterprises (SOEs) and thus affecting the banking system. As the government aims to lower the fiscal deficit, SOEs are borrowing heavily to finance infrastructure projects, which is translating into higher leverage levels. If protracted, this trend could force SOEs to scale down investment spending or turn to the public coffers for recapitalization. A strong expansion in public infrastructure spending and rising private investment and FDI inflows on the back of higher commodity prices will spur growth this year. Moreover, relatively subdued inflationary pressures and an accommodative monetary policy will support private consumption. However, faster hikes in U.S. interest rates could drive capitals out of the country, prompting a tightening in financing conditions and weakening the currency. FocusEconomics panelists see GDP expanding 5.3% in 2018, unchanged from last month’s forecast. In 2019, the economy is seen growing 5.4%. President Nana Akufo-Addo has stated on several occasions, most recently on 6 March, that the economy grew 7.9% last year. Although official data is still outstanding, available indicators suggest that the economy finished 2017 on a strong footing; improved local currency stability and easing inflationary pressures buttressed domestic demand throughout Q4. According to available data for Q1 2018, the momentum seems to have carried over into this year signaling continued improvement in economic conditions Q1. The external sector, which performed robustly in Q4 2017, likely continued its solid performance in the first months of 2018: Global prices for oil and gold—Ghana’s key commodity exports—moved above the 2017 annual averages in recent months. Meanwhile, the PMI for February points to the strongest improvement in business conditions since September 2017 on the back of robust output and new orders growth. The favorable price outlook for gold and oil, coupled with an expected oil production increase, should lift economic activity, making Ghana one of the fastest-growing economies in Africa this year. Monetary and fiscal discipline should drive investor and consumer confidence, fueling overall domestic demand. Nevertheless, the economy remains vulnerable to global commodity price changes. The government also needs to boost revenues and cut debt, following a long history of high budget deficits and public debt levels. Analysts expect GDP to grow 7.1% in 2018, unchanged from last month’s forecast, and 6.1% in 2019. Incoming economic data remains largely encouraging, with GDP growth picking up more than expected in the October-to-December period, and leading indicators showing the recovery carrying over into the final quarter of the fiscal year. The robust GDP print reflected higher government consumption growth and increased public capital outlays, which more than offset a moderation in private spending growth. That said, consumption indicators have mostly bottomed out and are now gaining traction: In February, passenger and two-wheel vehicle sales rose robustly, and consumer goods production expanded at its strongest pace in over a year. The Indian economy is, however, far from being out of the woods. Recent developments in the banking sector, including stricter non-performing loan resolution processes and large-scale fraud scandals in public sector banks (PBS), pose a sizeable downside risk to growth. This is compounded by rising yields, which are putting pressure on PBS profitability. Ethiopia remains mired in a political crisis following the resignation of Prime Minister Hailemariam Desalegn in February. A new leader has yet to be named by the ruling coalition, and anti-government demonstrations and outbreaks of violence continued in recent weeks, despite a state of emergency being declared. The new prime minister will need to focus on calming political and ethnic tensions, as well as ensuring cohesion within the ruling coalition for smooth policymaking. Economic momentum, however, is unlikely to be derailed by the current political uncertainty, and the incoming leader will inherit one of Sub-Saharan Africa’s fastest growing economies, supported by a robust infrastructure investment program. This month, FocusEconomics analysts upgraded their view of the economy and now see GDP expanding 8.3% in FY 2017, a notch above last month’s projection. Public spending and favorable demographics should support activity, although low international reserves are a source of concern, as they increase the economy’s vulnerability to external shocks. Growth is seen moderating slightly to 7.8% in FY 2018. 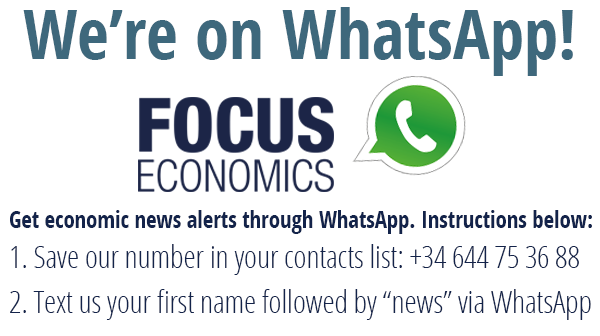 FocusEconomics covers 127 countries and 30 key commodities every month in the FocusEconomics Consensus Forecast report. If you'd like to download a free sample, just click on the button below.